Is Kim Playing Wag-the-Trump? Or is Trump Going to Put KIM on the POO Train? It’s time for some progress in North Korea. Kim is tired of the sanctions. Trump wants to fold, but it’s that damn Pompeo. He just won’t give in. “Ok we shut down reactor for six billion dollars” said Kim. Uhmm didn’t you say that in the 90s? “Come Onnnn! You wanna deal? Deal or no Deal” a smiling Kim replies. And that may be the bigger issue. After all this work, Trump is trapped. He simply cannot come back with egg on his face, which is more food than in all of North Korea. The problem is there is NO WAY kim will ever de-nuclearize. Ok we said it. They just wont. Cause without Nukes, theres no way that nation will continue to exist, 5000 artillary aimed at Hanoi not withstanding. Still they are going to try. And one suspects Trump would be going if there was no deal imminent. Un, who travels with all his PEE and POO (he worries someone might analyze it) is running out of room in his green armored train. “HE POO TOO MUCH. BACK CAR ALREADY FULL!” said Har Go Fat, an attendant on the green train. And every day the talks go on, the POO will keep increasing filling car after car until finally Kim himself is forced into the conductors car. “IF TALK GO TOO WRONG, NO ROOM FOR KIM AT ALL. ALL POO!” said Har, before north korean officials dragged him off. “Poooooooo” he droned on as he faded into the distance. Here’s an idea. Let medicine flow in and maybe some good American Pork. You know the koreans LOVE pork. Hold that tasty sandwich out for Kim and odds are he’ll bite. All we need is a TIMETABLE for de-nuking. A fat pork sandwich. Deal? Even better, since the North Koreans are too scared to eat any food, just hold really really REALLLY long meetings. When FAT KIM’s tummy rumbles after 12 hours, he’ll sign away his nukes and his first born for a good hamburger. Will they reach a deal? 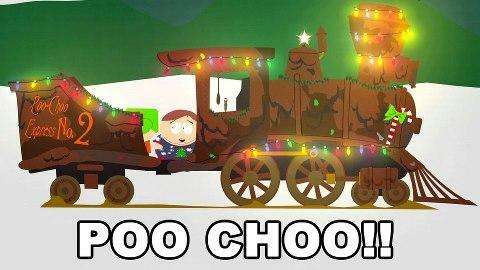 Will the train explode with POO? Find out, same bat time, same bat channel! Previous Previous post: Oscars Has No Host, I Know Let the NEGROS PRESENT!